While Cinema Vehicles has been partnering with Alan’s Auto Glass on various feature films and T.V. series since our inception, we recently acquired the iconic and trusted glass company to create a full-service glass fabrication shop, providing custom auto glass for movies, television, and commercials in Los Angeles. From our work on Knight Rider and The A-Team to Spiderman and Heat, Alan’s Auto Glass and Cinema Vehicles continue to make a great team. Whether you need custom car windows for movies or breakable glass for storefront windows, we can handle all of your on-set needs with the best custom auto glass and glass alternatives for movies in Los Angeles since 1960. Cinema Vehicles’ glass services can accommodate any job with our full-service shop and comprehensive inventory of automotive glass and molds. 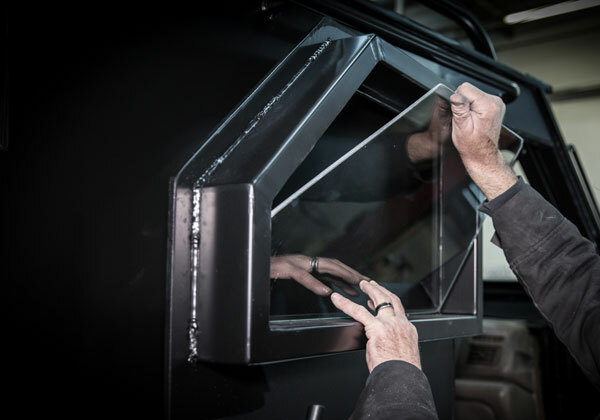 We can create custom auto glass and windows, as well as factory replacements. Forming clear glass is an integral part of movie filming that eliminates the complications that come with standard automotive glass. Since standard automotive glass in the United States is tinted to prevent ultraviolet light, it appears green as the camera shoots through it. From our headquarters in Los Angeles, we create custom auto glass for movies that eliminates green glass from photography and post-production. Does your shoot call for a custom car or rare vehicle that no longer has replacement glass support? We can quickly manufacture custom glass in any shape or size to fit your vehicle. In shoots where a glass alternative is required, we can create custom plastic window replacements to meet your specific production needs. Cinema Vehicles is equipped to handle any job, anywhere in the world, and has the legacy of Alan’s Auto Glass mastermind, Lee Festich. Our turnaround time is the best in the industry, as all jobs are done on site, where we carry the largest back inventory of automotive glass and molds in the business. Our technicians are available to assist with all of our Los Angeles custom auto glass orders for movies in-house or are happy to come to you on set. For questions about Cinema Vehicles custom car windows for movies, television, and commercials, or to speak with our customer service team, please visit our Contact Us page. Full service glass for both custom and factory replacement. Custom plastic and clear glass services is our specialty.